On the Centenary of the Battle of the Somme in Manchester, a remembrance walk took place from the service at Manchester Cathedral leading to the Heaton Park Somme100 memorial event. 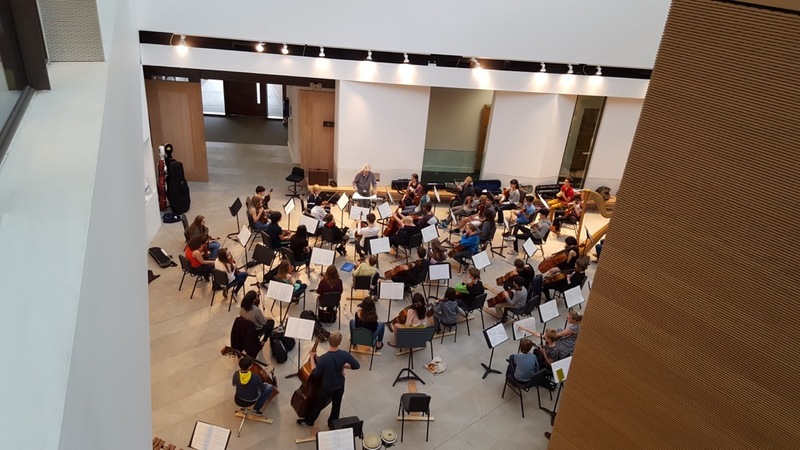 There were events happening en route and one of them was attending a run through of The Battle of the Somme film performed live by Chetham’s Sinfonia in the Atrium at Chetham’s College of Music. The wonderful musicians at Chetham’s and their brilliant conductor Stephen Threlfall have played a key part in the Centenary tour. They also performed the score at Manchester Cathedral, an open rehearsal at IWM North + filming for The One Show and an open rehearsal at IWM London + filming for BBC The People Remember. A small group of the orchestra also performed the score with musicians from Jersey School of Music at Jersey Opera House at a weekend of WW1 events. I am very grateful to Chetham’s Sinfonia for their brilliant playing and enthusiasm in all these performances. It has been great to get to know and work with such a talented and friendly bunch of young musicians and has been a privilege to work with them.